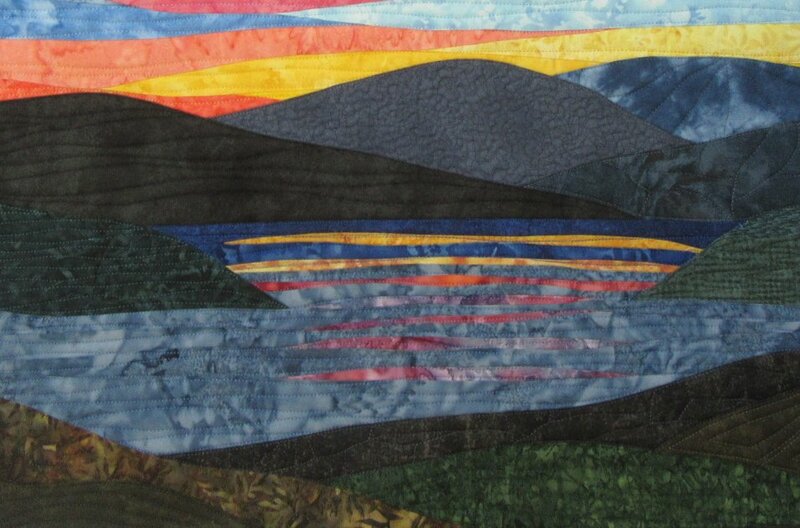 In the last few years I have made about a half a dozen sunset quilts with sunlight reflections over water. While my landscape art quilts are all somewhat abstract, I have continued to refine HOW I create a reflection of a sunset over a lake. I study photographs and paintings of sunsets over water to get ideas on how the colors reflect. I’ve also decided I personally like the reflection colors to be more subtle than bold. Some of my earlier efforts had the reflections depicted with bands of color which were bright and wide. See the first photo in this blog. I’ve tried yellow fabric strips sewn into the dark blue of the water but even using very narrow bands of color seemed too bright. As I’ve come to realize many of the sunsets I’m familiar with include a lot of pink so I decided to use more mauve colors on the water. With the most recent art quilt in this sunset over water theme (Sunset 50) I used very narrow strips of fabric which I think worked much better. For the reflection of the yellow part of the sunset closest to the horizon, I used a mottled gold fabric. For the more dominant pink parts of the sunset reflected on the water, I used a mottled batik with mauve, dark blue and some grey in it. Narrow strips of this mottled fabric create uneven color which is exactly how a reflection in water appears. My best assessment of these reflection on water efforts is done from observing the art quilt from 10-15′ away, where the colors blend and become a true landscape. Another way I check my interpretation of the colors is to take off my glasses, stand fairly close to the quilt and let my nearsighted eyes collect the colors but not the details. I will continue to refine my depiction of reflections on water but I think Sunset 50 is getting closer to what I like the best.